Transcom - RFMW UK, Ltd.
Transcom are a vertically integrated Amplifier company with internal foundry, thin film and GaAs processing facility. 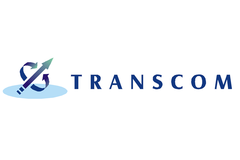 Transcom are based in Taiwan and offer both transistor devices and full amplifier products and sub-systems. Device technologies are offered with GaAs PHEMPT and MESFETs, MMICs, and hybrids. The company’s expertise is on design and mass production of high performance GaAs devices for both high power and low noise applications. Standard processes include0.25 um and 0.5 um PHEMT, HFET & MESFET.